It will be a busy time for Chevrolet at the Paris Motor Show. Along with debuts for Orlando MPV, the five-door hatchback version of the Cruze, plus the the first look at the Aveo small hatchback, the brand will reveal a revised version of the Captiva. Sporting a new front end design, a range of enhancements to the interior and new engines and transmissions, the Captiva also retains the theatre-style seating in three rows which accommodates up to seven passengers. It's set to go on sale in the UK in Spring 2011. From the outside, a number of features are immediately noticeable such as the reshaped and sharply sculptured bonnet, a new larger grille, prism style headlamps and integrated LED indicators on the door mirrors. There are new exterior colours and the accentuated wheel arches will accommodate wheel sizes of 17 inches to 19 inches. It's under the Captiva's bonnet that the most significant changes are taking place, with no less than three new powerful engines that will come as standard with a new manual or automatic six-speed transmission for a powerful, smooth drive. The new engine line-up, which is comprised of one petrol engine (2.4L) and two turbo-diesel variants (2.2L), incorporates a host of advanced technologies aimed at delivering an optimal balance of performance and fuel economy. The new 2.2 litre common rail turbo-charged diesel units will be available with either 163bhp or 184bhp outputs, while the 2.4-litre dual overhead cam gasoline unit with variable valve timing, is rated at 171bhp. 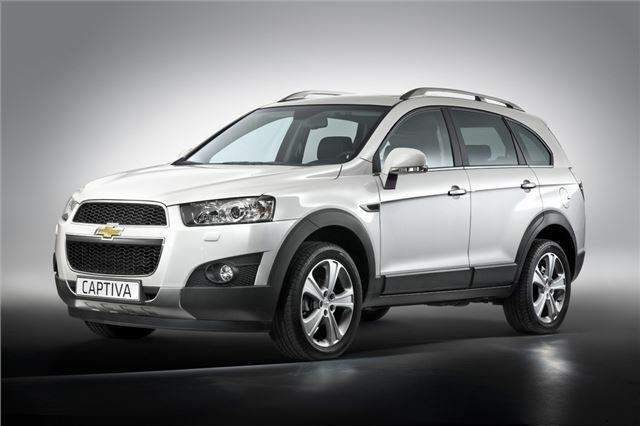 The new Captiva's chassis has been re-tuned to improve cornering, roll characteristics and ride feel. With Electronic Stability Control (ESC), Traction Control System (TCS) and Braking Assist System (BAS) standard, as well as front, side and curtain airbags, the Captiva provides a high level of safety. Inside there's the option of either 5 or 7 seats. The Captiva's upgraded interior now features new finishes and textures including all-new seat fabrics and interior trim designed to give the car a more upmarket feel and look. The new Captiva features Hill Start Assist, eliminating "roll-back" on hills and an electric park brake that opens up space for further storage in the center console, including two one-litre cup holders. The new Captiva's audio system includes Aux-in, USB-port and Bluetooth connectivity while there's improved acoustic engineering resulting in reduced road, wind and engine noise. The Captiva can be ordered with a touchscreen navigation system with a rearview camera for parking assistance.